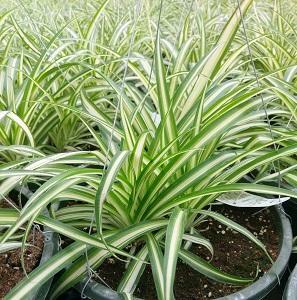 The Spider Plant has long green leaves with yellow centers. It does well in containers and hanging baskets and although it prefers an indoor environment, it can be kept outside as well. Removes any brown tips or yellow leaves to keep this plant thriving. Do not overwater, as the Spider Plant is susceptible to root rot if it gets waterlogged.